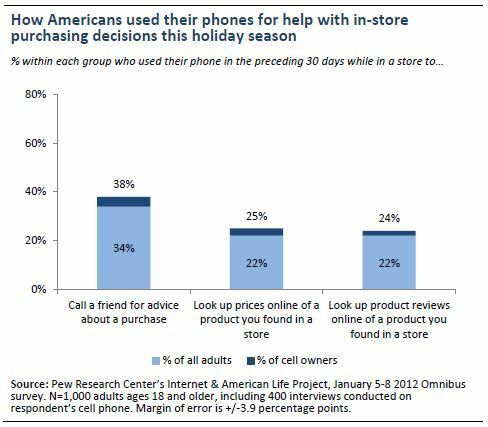 Just over half of U.S. adult cell phone owners used their handsets for shopping assistance while in stores during the 2011 holiday season, a new Pew Research Center survey shows. In a 30-day period before and after Christmas, nearly 4 out of 10 mobile users phoned a friend from inside a brick-and-mortar store to seek buying advice. A quarter of cell owners used their phones while inside a store to go online and find product reviews. And a quarter of adult cell users went online to see if they could find a better price for a product they were considering buying, the Pew study found. Younger folks were much more likely than their parents and grandparents to use their phones as shopping tools. Sixty-three percent of cell owners from ages 18 to 49 either called a friend for buying advice, or looked up product reviews online. For ages 30 to 49, the percent fell slightly to 59 percent. And only 25 percent of 65-and-up cell users phoned friends or looked for online reviews. For brick-and-mortar retailers, the Pew findings are sobering. Mobile devices are rapidly becoming essential shopping tools, and more smartphone- and tablet-toting consumers will soon insist that physical stores match or beat the prices of their online competitors. It's no wonder that retailers are a tad testy. The Retail Industry Leaders Association recently griped about one of Amazon's price-matching promotions that gave shoppers a 5-percent discount for using Amazon's smartphone app to compare the online retailer's prices with those of physical stores. The bad news for retailers: Mobile devices are here to stay, and price-matching is only going to get more popular.